Vincent Robert Capodanno was born on February 13, 1929, in Staten Island, New York, as the tenth child of Italian immigrants, Vincent Robert Capodanno, Sr. and Rachel Basile Capodanno. Vincent graduated from Curtis High School in Staten Island, New York and entered Fordham University. After attending Fordham University for one year in 1949, young Vincent Capodanno, who was familiar with the missionary work of the Catholic Foreign Mission Society- the Maryknoll Fathers, applied to and received acceptance to Maryknoll Missionary seminary in upstate New York. The Maryknolls were well known for sending American missionaries to Asian countries like China and Korea. As the Communists conquered China, the Maryknoll priests and bishops were subjected to imprisonment and torture. Vincent looked forward to the day he would be working for God in foreign countries. When Capodanno finished the seminary, he was ordained a priest on June 7, 1957 by the late Francis Cardinal Spellman, Archbishop of New York and Military Vicar of the United States Military Ordinariate. He also received a bachelor's degree in religious instruction. He spent the following seven years on Taiwan as a Maryknoll Priest, administering the sacraments, teaching native catechists, and distributing food and medicine. While on a six-month furlough and home visit, Fr. Capodanno learned that he would not remain in Taiwan. His new assignment was to be Hong Kong--a change which caused a new direction from Fr. Capodanno to God’s call for service. In 1965 Father Capodanno sought permission to join the Navy Chaplain Corps intending to serve the increasing number of Marine troops in Vietnam. Maryknoll granted this request, and after finishing Officer Candidate School during Holy Week of 1966, Father Capodanno reported to the 7th Marines in Vietnam. As the chaplain for a battalion, his immediate focus was the young enlisted troops known as “Grunts.” Later, he was transferred to a medical unit where Chaplain Capodanno was a combat priest ministering daily in the deadly carnage of war. He became a constant spiritual companion to the Marines where he daily lived, ate, counseled, prayed and slept in the same front line battle conditions as the Grunts. He spent hours reassuring the weary and disillusioned, consoling the grieving, giving Last Rites, hearing confessions, instructing converts, conducting daily Mass and tending to the welfare of his Grunts who were constantly in harms way. He established libraries, gathered and distributed gifts and organized outreach programs for the local villagers. His work inspired him so much that he requested an extension beyond his 13 month tour (May 1966 to June 1967) to remain with the Marines. It was during the approved tour extension that the Grunt Priest, Lieutenant Vincent Robert Capodanno USNR, made the ultimate sacrifice. Chaplain Capodanno had only been with the 3rd Battalion/5th Marine Regiment a few short weeks after his transfer from 7th Marine Regiment. 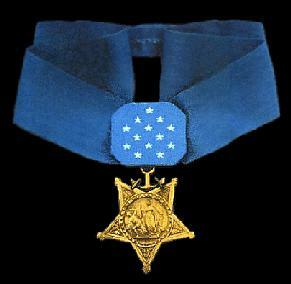 He had been recommended for the Bronze Star in May 1967 for his time with 7th. He was in the process of requesting to give up his R&R leave to be with his grunts for the holidays when he was killed. It was on September 4, 1967, after many hours of heavy fighting during a North Vietnamese ambush, that Father Capodanno, himself seriously wounded, sighted a severely wounded corpsmen pinned down by an enemy machine gunner. He ran to the Medical Corpsman to administer medical and spiritual attention. Father Capodanno was unarmed and already wounded twice when the enemy machine gunner opened fire inflicting the Grunt Catholic Priest with 27 bullet wounds. Father Vincent Capodanno died faithfully performing his final spiritual act as a good and faithful servant of God. To read an eye witness account of the Grunt Padre's heroic death go to Fred Tancke, US Marine. 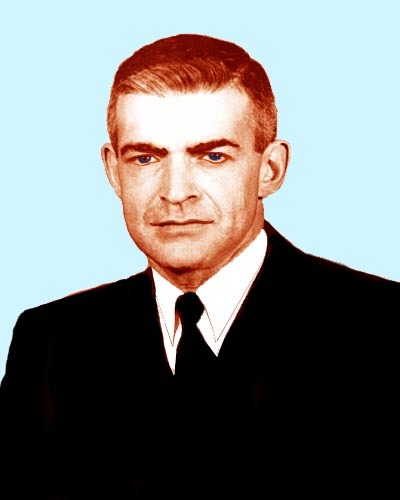 Posthumously awarded the Medal of Honor in 1969, Lt. Capodanno was also the recipient of the Bronze Star Medal, the Vietnamese Cross of Gallantry with Silver Star, and the Purple Heart Medal. 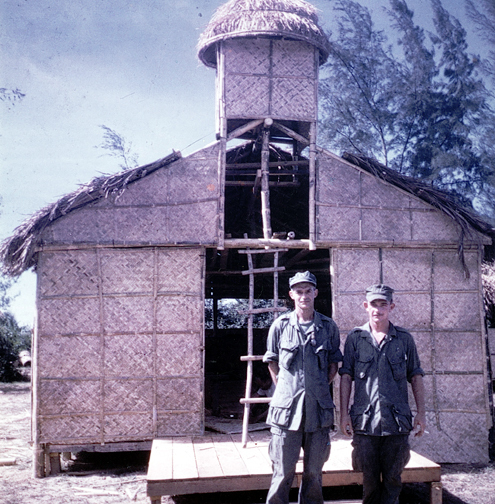 Soon after Father Capodanno’s death, the first chapel bearing his name was dedicated on Hill 51 in Que Son Valley, Vietnam. Father Capodanno had helped build this simple place of prayer and peace that was constructed of thatched palms and bamboo. On February 5, 1968, within four months of his death, the chapel at the Navy Chaplains School at the Newport Naval Base, Rhode Island, was dedicated as The Capodanno Memorial Chapel. Other military chapel commemorations are the Capodanno Chapels at the Naval Hospital, Oakland, CA, the Marine Corps Air Station, Iwakuni, Japan., Camp Pendleton, CA, and Ft. Wadsworth, Staten Island, NY, as well as Thiankou, Taiwan, which honors the priest who began his missionary work in that country. A significantly prestigious memorial was the naming of the USS Cappodanno, a ship whose motto “Duty with Honor” exemplified the chaplain service of Fr. Capodanno. During its 20 years of operations service, it was further distinguished as the first ship in the US Fleet to receive a Papal Blessing while docked in Naples. Further military buildings bearing his name include the Vincent Robert Capodanno Naval Clinic in Gaeta, Italy, Capodanno Hall, a bachelor officers’ quarters at the San Francisco Bay Naval Shipyard and the Capodanno Research Facility at the Navy personnel offices in Millington, TN. Other tributes, geographic reminders preserving his name are: Capodanno Boulevard in Staten Island, NY, and Capodanno Street at the Naval Base, Newport, RI. Fr. Capodanno’s name appears on many other veteran memorials throughout the United States honoring individual servicemen and certain designated groups such as the Freedom Foundation in Valley Forge, PA; the Catholic Chaplains Memorial at Arlington National Cemetery; the Veterans Memorial, in Kokomo, IN; and the Vietnam Memorial on the Mall in Washington, DC, as well as the Chaplain Vincent R. Capodanno Shelter for Homeless Veterans, in Boston, MA. The process of Father Vince’s Cause for Canonization was initiated by the Archdiocese for the Military Services May 8, 2006. Father Vincent Capodanno was named "Servant of God" which is the first step toward Sainthood. 44 years have elapsed since the Grunt Padre's heroic death in the treacherous jungles of Vietnam, September 4, 1967. Father Vince was affectionately referred to as “The Grunt Padre,” a term given to him by the marine infantry men he ministered to. Father Capodanno served back to back tours in Vietnam, received the Bronze Star and three Purple Hearts for injuries sustained in a single day and was posthumously awarded the Medal of Honor for his courage and sacrifice in combat. The Archdiocese for the Military Services shepherds the advancement of the Canonization Cause as the competent diocese in charge of the Father Capodanno project. Countless numbers of loyal and faithful Catholics prayerfully await the completion of the next step in the Canonization process for Father Capodanno. Father Vincent Capodanno left the safety of a parish in Taiwan in 1966 to serve as a Navy chaplain to Marines in Vietnam. Prayers to Father Capodanno that have positive consequence may provide the proof of miracles that would keep Father Vince moving toward becoming the Patron Saint of Marines. Periodic progress reports are provided upon request from the office of Postulator for the Cause of Canonization at www.milarch.org. Thank You Father Vincent Capodanno for all you did for us and what you will continue to do for all your loyal worshipers.